Category: Power Tool Starter Kits. If you want a kit specifically for polishing concrete or terrazzo, call us and we’ll put together a slightly different set of pads. Flex LW1503 dedicated wet polishing machine. 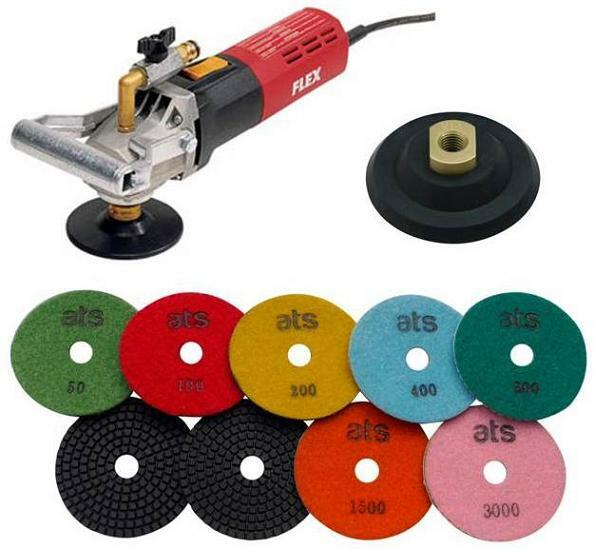 100mm or 125mm Premium wet diamond polishing pads – 9 pieces in the following grits: 50, 100, 200, 400, 800, 1500, 3000, buff white, buff black. 100mm or 125mm Velcro rubber backer hard + 100mm or 125mm velcro rubber semi rigid backer.